North Central CMED operates on a UHF (Ultra-High Frequency) two way radio system. 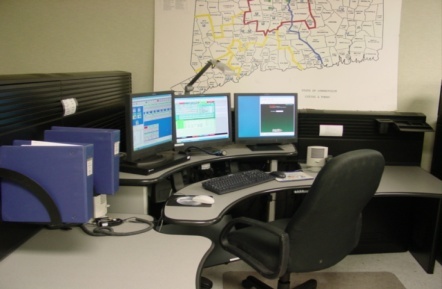 The Center is operational and staffed 24 hours a day, 365 days a year by highly trained Public Safety Telecommunicators. The system's base stations are connected to remote terminals located in the hospital emergency departments by means of a Motorola MCC-5500 dispatch console. This technology allows for the hospital and field radios to communicate with each other through the CMED Center. North Central CMED is actively involved in regional Mass Casualty Incident planning and coordination. Must be at least 18 years of age with a High School diploma; able to speak English clearly; able to work well under pressure and multitask. Candidates meeting the hiring criteria will be required to sit for a 30-minute "Perfex" Simulator exam. On February 16, 1968, Senator Rankin Fite completed the first 9-1-1 call made in the United States in Haleyville, Alabama. The serving telephone company was then Alabama Telephone Company. This Haleyville 9-1-1 system is still in operation today. It is with great sadness that we report the passing of Doug Knowlton of Marlborough Fire Department. He died late Monday afternoon, April 1, 2019. Doug was a long-standing member of the North Central CT EMS Council. In 2003, Doug was appointed to North Central’s Board of Directors and Communications Committee representing the Town of Marlborough. He accepted the position as the CMED Communications Chairperson in 2016. It was important to him that each community appointed a representative to serve on the Communications Committee. Doug was appointed Secretary to the Board of Directors in 2018. Our condolences to his family and the Marlborough Fire Department. We will miss him. North Central CMED is sad reporting the loss of one of our own, Jeffrey Bilodeau. Jeff passed away unexpectedly early Sunday morning, November 20, 2016. Jeff was dedicated to the service of others. Jeff carries with him our gratitude and appreciation for his service of others in his career as an EMS Dispatcher, volunteer firefighter, EMT, and finally as a Lead Operator here at North Central CMED. Our condolences to his family. His presence is missed at North Central CMED.